The Debinder Tool is compatible with all GBC Strip Binding systems. It provides a manual method for rapidly debinding documents to add, replace or remove pages. The GBC Velobind Debinder Tool is used to safely and simply debind documents bound with GBC's hot knife binding systems. 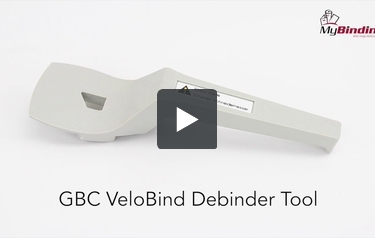 The Velobind Debinder tool works with documents bound with both GBC SureBind and GBC Velobind using a razor blade mounted inside of a safe and easy to use tool to cut the permanently bonded binding strips from your books. Debinding strip bound documents any other way can be very dangerous and the Velobind Debinder Tool is reasonably priced so that any user can afford it. Encased blade shears through heat-sealed SureBind or VeloBind strips without damaging the document. Saves time by editing current document rather than reproducing new copies. Includes instruction sheet with pictures. Works.What else is there to say? Works. What more is there to say? Welcome to MyBinding video. This is the GBC VeloBind and SureBind Strip Debinder Tool. This tool is used to safely and simply debind documents bound with the GBC HotKnife Binding System. As you can see with the blade, you're actually cutting off the binding from your book. To proceed with removing the binding, flip the book so the back is facing you. Gently place the debinder blade between the back cover and the binding itself. To cut through your binding, twist the handle away from your paper while pulling toward yourself. It may take a couple of times to get it right but once you do, removing these bindings is pretty easy. Keep in mind that this binding's not made to be removed easily so the process is more likely to cause subtle damages to your pages but once you're done, your pages are free. You can now edit, add and rebind your book. For more demos, reviews and how-to's, go to MyBinding.com. The GBC Velobind debinder tool is designed to help users quickly and easily cut the spines off their documents that have been bound with a hot knife binding system. This tool is compatible with documents that have been bound with either Velobind or Surebind hot knife binding systems. These systems use heat to permanently rivet the pages of your documents in place. The only way to edit this type of document is to cut the binding strip apart and then rebind it when you have made your changes. Attempting to debind velobound documents without this tool can be very dangerous and is definitely a safety hazard. The Velobind debinder tool is extremely easy to use. You simply grab the handle of the debinder tool and work it under the edge of your binding strip. After you have severed the first pin, you can simply slide the tool the rest of the way down your document to cut the remaining pins. This tool provides the safest possible way to debind documents that are bound with a hot knife binding system. The blade on the debinder tool is not exposed. This makes it nearly impossible to cut your hand during the debinding process. If you attempt to use a razor blade or knife to debind a Velobind or Surebind document it is very possible that you will end up cutting yourself. It takes a fair amount of force to cut the plastic pins and it is easy for your blade to slip during the cutting process. Considering the cost of a hot knife Velobind system the debinding tool is actually very inexpensive. It sells for about fifteen dollars and is small enough that it can conveniently sit beside or on top of your machine without getting in the way. Although you can use this tool to cut other types of binding strips including One Eleven, Four Pin and Six Pin Velobind Strips it is not ideal for this application. The One Eleven binding strips are thicker and are more difficult to cut which will wear down the blade faster. Four pin and six pin strips are actually reclosable and documents bound with these systems can be edited without the need to cut the spine. When you use this tool you will ruin the binding spine that is on your document. You will need to make your changes to the document and then rebind the document using your hot knife binding system. If your machine is not handy it will be difficult to reassemble your book. The cost of replacing binding strips can also add up quickly if you need to rebind a large number of documents. Although in theory you should be able to replace the razor blade used on the debinder tool, replacement blades are not available from the manufacturer. The whole tool will need to be replaced when the blade becomes worn and will no longer cut. The Velobind Debinder tool is a relatively inexpensive tool to help you debind and edit your documents that are bound with a hot knife binding system. In fact, any owner of a Velobind or Surebind hot knife system should really consider having one of these tools on hand. Unfortunately the blades on this tool cannot be replaced and you will have to buy a new tool when you have worn your current one. Perhaps someday GBC will begin to sell the blades to help prolong the life of these tools. One of the biggest selling points for the GBC Velobind / SureBind strip binding systems is their security. The security that these binding systems provide can become a problem if you ever need to add or delete pages from your document. For this reason, GBC has developed a Velobind debinder tool. This specialized tool is equipped with a razor blade that helps you to safely remove the binding strips from your documents. Here are some tips for using the Velobind debinder tool. Place the document face down on a surface. The velobind strip should be at your right with the formed rivet heads up. Holding the document in place with the left hand and using the debinder with the right hand, insert the blade between the strip and the document cover. Make certain that the debinder tool is snug against the right edge of the document to provide shearing leverage. Pull the Velobind debinder tool towards you until it contacts the first stud. With the debindder snug against the right side of the document and continuing to pull towards you, swing the handle of the Debinder to the right, away from the document. This automatically shears the first stud. Move the Debinder to the next stud, swing to shear, pull to the next stud, swing to shear, pull to the next stud and so on. For rapid debinding, the Debinder can be pulled toward the user in one continuous motion after the first stud has been sheared. This does require a fairly strong hand, and extreme caution should be used with this method to avoid tearing the coverstock. Remove the plastic strips, and debinding is complete. Attempting to Debind GBC Velobind and Surebind documents without the GBC Velobind debinder tool can be very dangerous because such a sharp blade is required. For a minimal investment the debinder tool is definitely a tool you should have in your office. I was just told over the phone that the debinder could be used to help secure the binder strips as well as debinding. Did I understand that correctly? The video and written info seem to indicate it is for debinding ONLY. There are 2 different types of debinding tools. This specific tool is meant to unbind. We had another which is discontinued at this time, that would bind 4 pin velobinds. This specific tool is only meant to cut apart the book. If you have any other questions, please call us at 800-944-4573. Does this product come with a replacement blade? Or is there no way of replacing the blade? This product does not come with a replacement blade. I believe that replacement blades are available through our parts department. Please give us a call at 1-800-944-4573 and we should be able to assist you in getting a replacement blade for your debinder. Is this product required for Velobinding or is it optional? This is not required for binding documents with Velobind. It provides a simple and safe way to debind a document that is permanently sealed with a hot knife velobind system. It uses a razor blade that will but the pins from the Velo Bind and offers a design that is a lot safer than using a box knife or letter opener.